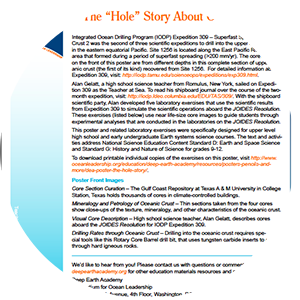 Actvity Summary: The “Hole” Story About Ocean Cores will introduce your students to core description and curation techniques used by scientists and technicians during Integrated Ocean Drilling Program Expedition 309! The “Hole” Story About Ocean Cores will introduce your students to core description and curation techniques used by scientists and technicians during Integrated Ocean Drilling Program Expedition 309. Lab groups can work together to examine high resolution photos and data from four cores taken at various depths in this first-of-its-kind complete section of oceanic crust. This poster includes background information and five classroom activities on the back.